the introduction stated that using thermal polarization (brute force method) in low temperature, ~ 0.01K and high magnetic field~10T can produce proton polarization as high as 76%. another way is using dynamical method by paramagnetic materials, (was proposed by Overhauser) the coupling between electron spin and proton spin can polarize proton in higher temperature and lower magnetic field. Abragam proved that by using paramagnetic impurity can also work for non-metallic materials. Abragam and Jeffries used (or called LMN), containing small percent of neodymium to polarize proton spin by dynamic nuclear polarization at 1963. but the LMN crystal is not good for inelastic reaction because of the low dilution factor ( the ratio of polarized proton to total number of nucleon ), and this produce a lot other un-wanted reactions. and also the crystal is damaged under scattering by relativistic particles. organic materials are tested and a major breakthrough is by using butanol with water doped with porphyrexide in 1969 by Mango t al.. the polarization is 40% at 1K and 2.5T. and also, diol with were polarized to 45% at 1K and 2.5T by Glättli et al. Masaike et al. was polarized diol up to 80% at temperature lower then 0.5K. Burtanol in cryotat also polarized upto 67%. All these were done in 1969.
is Brilluin function and is the nuclear spin temperature. Spin Frozen Target is a technique that the polarized proton spin last long enough with ESR radiation. the theory was developed around 1965 by Schmugge and Jeffries and constructed by Rusell at 1971 in Rutherford laboratory. or ammonia has high dilution factor. it was polarized to 70% by doped with ethylene glycol complex at 0.5K and 2.5T by Scheffler and Borghini at CERN at 1971. but ammonia has slow growth of polarization and may explode by high intensity proton irradiation at 1983 at CERN. but later, it was overcomed by Meyer et al. at Bonn. Thanks to Meyer, ammonia becomes a popular polarized target. High polarization of H, D and in dilution refrigerator were found in Bonn around 2005. The COMPASS experiment in CERN use target of $latxe ^6LiD$ at polarization 50% at 300mK and 2.5T. Hydrogen deuteride (HD) has the highest dilution factor and in principle, both can be polarized. the relaxation properties at 0.5K depends on ortho-para and para-ortho conversions of $latxe H_2$ and $latxe D_2$. The polarization for proton and deuteron of 60% and 14% by brute force method at 10mK and 13.5T was done by Grenoble-Orsay group at 2004. Crystal of Naphthalene (77K) and p-tarphenyl (270K) doped with pentacene have been polarized in 0.3T by Iinuma et al. at 2000. the high temperature and low magnetic field is due to the paramagnetic excited state in pentacene and diamagnetic on ground state. the population of Zeeman sublevels of the lowest triplet state is 12% for m=+1, 76% for m=0 and 12% for m=-1 regardless of temperature and magnetic field strength. by using ESR radiation and the “integrated solid effect”, the proton can be polarized and remain polarized after the electrons go back to ground state. 70% polarization at liquid nitrogen temperature. This paper presented an clear a beautiful way on measuring highly charged state decay by the Schottky Mass Spectrometry. The charge state does not change. Thus the frequency different is due to the mass different between parent and daught nucleus. that give an increase in frequency by 270Hz. both the charge state and mass changed after the decay. this make the frequency decrease alot. by this mean, we can observe the decay in a very clear detail. By using the area of the Schottky frequency peak, They can identify the number of ion inside and the charge or it. because the peak is proportional to the number of stored ions and the square of charge. the synchrotron frequency is about 2MHz. the data is analysed by FFT. each FFT frame has bandwidth 5kHz and was collected for 128ms. in this period, the ions will have 256,000 revolutions. This set of data will be FFT analysed and plot with time. the half life of the ion is about 3.39min, thus, the time resolution is very good to give precise measurement on decay time. quantum beat between 2 hyperfine structure F=1/2 and F=3/2, where the nuclear spin is 1. but they also concluded that the quantum beat frequency is still 2 large for accounting it. an oscillation of neutrino mass state. Note: since the half-life is 3.39 min, is there other way to measure the electron capture and verify the 7s oscillation?? This paper show a 42% of nuclear spin polarization on phenanthrene doped in fluorene by Dynamic Nuclear Polarization (DNP), or more specific, the Integrated Solid Effect (ISE) or Integrated Cross-Polarization (ICP), or Microwave-Induced Optical Nuclear Polarization (MIONP). they use 75GHz microwave at 1.4K. the paper pointed out that conventional guest molecule is paramagnetic in ground state. That provided a channel for nuclear spin-relaxation and reduce the polarization. in contrast, this paper use a paramagnetic triplet state and diamagnetic ground state. Thus, when the excitation laser is turned off, the nuclear-spin relaxation can prevented. 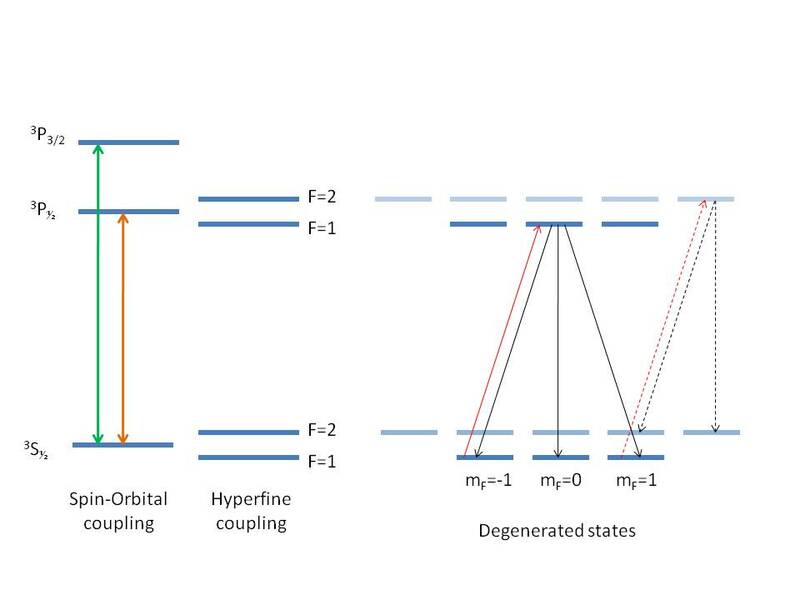 This paper reported an excellent detail and considerations on polarization of nuclear spin by Dynamic Nuclear Polarization (DNP) method. the polarizing sample is naphthalene with 0.018mol% of pentacene. Pentacene has a paramagnetic triplet state with population independence of external magnetic field and temperature. This paramagnetic triplet state is very suitable on DNP, since the paramagnetic state like a switch to turn on the nuclear spin relaxation, due to the state will decay to diamagnetic state. High Inter-System-Crossing rate, which is the rate from higher excited state to the triplet state, so faster the polarization build up time. Suitable triplet state life time and electron spin-lattice relaxation time. long enough for transfer the electron spin to nuclear spin, but not so long that nuclear spin can use the paramagnetic triplet state as a channel for spin relaxation. the pulse width should longer than the lifetime from excited state to the triplet state, but shorter than the triplet lifetime. the intensity should be very high, so, the triplet state excitation depth increase. but it is not so high to increase the stimulated emission. high intensity may melt the sample. the time interval should be long and not excess the adiabatic limit. the sweeping range should be cover the ESR line width. the field sweep should be within the lifetime of the triplet state. where T is temperature, N is number of proton spin, g is receiver gain and E is the recorded signal amplitude. at the end of this paper, it talks about some applications. The Dynamic Nuclear Polarization (DNP) means we has a pumping source to change the population of nuclear spin, then create a polarization. in contrast, Static Nuclear Polarization (SNP) means thermal equilibrium of nuclear state population. obtain detail information on static and dynamic interaction between nuclear spin and its environment. this paper focus on a general system and represents them by graphs ( called chart in the paper ). the graphs are based on electron spin ½ and nuclear spin also ½.
on section II, it give out the Spin Hamiltonian and use it for the discussion on the population distribution. by that, the author used the rate equations to related the population in each state. Then, he defined the Enhancement of polarization, which is the ratio between the population with saturating radiation to the thermal thermal distribution. on section III, it mention about the first 2 successful dynamic nuclear polarization experiments around 1953-4. one group polarized the 6Li nucleus in metallic lithium. the other group polarized the 1H in solid DPPH. This paper is easy to read and give a very easy understanding on optical pumping. it also demonstrated an experimental setup on detecting this effect. worth to read. i am not going to reveal the detail and the experiment on the paper this time, but i just share my understanding on this subject. The electron’s spin is polarized by optical pumping. Photon has intrinsic spin 1, and, it can be liner polarized or circular polarized. A linear polarized photon carries 0 magnetic angular momentum, and a circular polarized photon carries ±1 magnetic angular momentum. Therefore, an absorption of a circular polarized photon will make an electron undergoes ΔJ=±1and Δm=±1 transition. In atomic energy level, a ground state is 3S½ and the next level is 3P½ and 3P3/2, the splitting of the P state is due to spin-orbital coupling between electron spin and the magnetic field generated by the orbital motion of the electron. Due to hyperfine coupling with the nuclear spin, the sub-shell will further split up. The good quantum numbers for hyper structure are |I-J|≤ F≤I+J and -F ≤ m_F≤F. The following graph demonstrated the I=3/2. The selection rule is ΔF=±1 and Δm_F=±1. The red line is the transition by absorbed a circular polarized photon, and the black lines are possible de-excitation. Since there are 2/3 chance for the lowest state to the higher states, then, the population will move and become unbalanced. If we set up a set of rate equations, we can find out the population of each state. A magnetic field is not necessary for optical pumping, as the graph demonstrated. The magnetic field for optical pumping is for measuring the effect. When a magnetic field is applied, the population will unbiased to, say, m_F=+1 state. Since there is no more state for absorption of the circular polarized light, then, the medium will become transparent. If we switch the magnetic field, the population will be inverted absorption will occur, and the medium become no-transparent. By measuring the intensity of the light pass through the medium, we can observe the effect of the pumping. we can see, if the number higher energy state is more than the number of lower energy state, the maximum state has an escape channel. Look at the graph, if we have transition from F=1 to F=2 state, the m_F=+1 can absorb a photon and go to the m_F=+2 state (red dotted line). Due to relaxation, the m_F=+2 can transit to the F=2, at 3S½ state ( the black dotted lines). Due to the lamb shift, the S-state is always little higher than the P-state in same shell. therefore, is it not possible to polarize the electron for Zero nuclear spin.